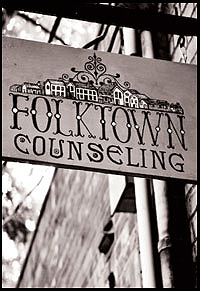 Folktown Counseling is a psychology-based, Seattle counseling service in the historic neighborhood of Ballard. We provide licensed psychotherapy for individual adults, couples and children. As a practice we view counseling as an ongoing process for personal growth and exploration of one’s problems. Using a relational style of psychotherapy we seek to address the whole person over any one presenting problem. It is our belief that counseling should both support and challenge clients in a safe and empathetic environment. We do this within a framework of ongoing weekly sessions. We strive to partner with you in the journey of your overall wellbeing. We not only work collaboratively with you in a mutual therapeutic environment, but welcome the possibility of working alongside your other health care providers if you request us to do so. And we are always happy to provide referrals to you for trusted health care providers if you request.